The 4th Azerbaijan-Belarus ICT business forum was held as part of the Bakutel-2018, the 24th Azerbaijan International Telecommunications, Innovations and High Technologies Exhibition and Conference on December 5. Elmir Velizade stressed that the intensive cooperation of our states in the field of ICT contributes to the strengthening of the potential of both countries and the introduction of advanced technologies and innovations in all areas. Then, the forum was addressed by deputy head of the Operational-Analytical Center under the President of the Republic of Belarus Sergei Zhernosek. He noted that the event discussed issues of cooperation between public and private entities of the two countries operating in the field of ICT. During the event, a memorandum of cooperation was signed between the Data Processing Center of the Ministry of Transport, Communications and High Technologies of the Republic of Azerbaijan and the Republican Scientific and Engineering Unitary Enterprise “Institute of Applied Software Systems” of the Ministry of Communications and Informatization of the Republic of Belarus. The main purpose of the memorandum is to develop joint projects and cooperation on their promotion in connection with the harmonization of the digital markets of the Eastern Partnership countries of the European Union within the EU4Digital program. This cooperation provides for the coordination of work and integration of planning efforts in interregional projects, implementation of projects (e-commerce, e-logistics) of the EU4Digital program, joint organization of activities of local projects and marketing issues to promote digital systems, reliable services, electronic commerce and logistics and digital transport corridors in the Republic of Azerbaijan and the Republic of Belarus, the preparation of joint proposals and the formation of a multidisciplinary project consortium, including ie the implementation of the program EU4Digital projects in Eastern Partnership countries. Furthermore, according to the memorandum, which will remain in force for one year, the parties agreed to exchange knowledge and experience in the areas of reliable services, e-commerce, e-logistics, information exchange on existing regulatory documents and technical standards in the framework of joint activities and projects in the relevant spheres, ensuring the participation of specialists in at EU4Digital workshops and other issues. Moreover, a memorandum of cooperation was also signed between Azerpost LLC and the Republican Unitary Enterprise of postal service Belpochta. The purpose of the memorandum is to develop and strengthen cooperation in the field of postal services, finance and electronic services between the parties. It should be noted that Belpochta is one of the main partners of Azerpost in the international postal exchange. The volume of post sent from Azerbaijan to Belarus in 2017-2018 for designated postal operators of the Republic of Belarus and the Republic of Azerbaijan amounted to 1987 kg, and from Belarus to Azerbaijan - 1781 kg. Azerbaijan’s only national postal operator Azerpost has been implementing the international HUB project in the field of sending and delivering e-commerce products for 2 years. Belpochta is also one of the main partners of Azerpost in the implementation of this project. The cooperation document signed today with Belpochta will help simplify postal and financial services between the designated operators of the two countries, EMS and logistics, develop e-commerce projects, international mail transport, tracking systems, technical support to facilitate electronic data exchange, traffic optimization, procedures for processing parcels, registered and unregistered mailed items, as well as registration of electronic mailings. Aztelecom LLC and Beltelecom Republican Unitary Enterprise have also signed a memorandum of understanding on cooperation in the field of information and communication technologies. The purpose of the memorandum is to develop cooperation in the field of communications by supporting and implementing joint activities between Beltelecom and Aztelecom LLC in the context of exchanging information and experience, increasing competition in the international telecommunications market. According to the memorandum, the promotion of high-quality and efficient communication technologies and services, joint consultations and active cooperation in the framework of joint communication projects, the exchange of specialists and experts, the organization of joint workshops, symposia and exhibitions will be carried out. 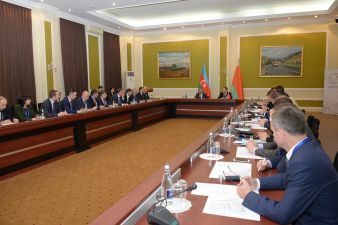 Then, from the Belarusian side, responsible persons of Beltelecom, NYULEND LLC, the Republican Unitary Enterprise National Traffic Exchange Center, and on the Azerbaijani side - Aztelecom LLC, Baku Telephone Communication LLC, State Administration of Radio Frequencies delivered speeches on the prospects for the development of the communications sector. And presentations were made on the topic of digital transformation by representatives of Belpochta, Republican Unitary Enterprise National Electronic Services, Giprosvyaz OJSC, the Scientific Engineering Republican Unitary Enterprise “Institute of Applied Software Systems”, and the Data Processing Center and Azerpost LLC.